Sorry friends that I haven't been blogging much lately. I've been trying to handmake a lot of our Christmas presents this year. And I just don't have much time to be crafty, cook, and blog. But we've been getting ourselves together ready for Christmas. So I haven't taken much time to share the good news. We finally sold our house!!! Monday November 28th, our old house finally Closed. On the day in question, Sam and I popped by to do one last walk through. Eric has worked so hard on the New House, he didn't feel near as sappy about leaving the old one as I did/do. I blubbered all through the house. I kept thinking about how I had brought my babies home here. This house had kept me safe, kept us all safe. It has been weird to see it getting more and more empty. For so long, I would pop by and grab a couple things to take with me. I didn't need to do that this time. All that was left was breaking down the crib (we'd kept it there to maintain Sam when we'd been there for any length of time, but he didn't need it much anymore) and grabbing the last pumps of Soap. But it was really empty now. The only things left were the Eric's grandparents' couches that they wanted to keep. I cried all the way home. I cried off and on through the closing. I was laughed at, and I couldn't place why the tears kept falling. Was I sad? Maybe. Was I going to miss the place? Some. I think what it really was, was hearing that my Prayers over the last months had finally been answered. God had finally brought the perfect family to our home. And now it was going to be someone else's Blessing. Our buyers were a pair of nice parents (the grandparent sort) getting the home for their daughter, who was in the midst of a rather icky divorce. We learned that a couple of teenagers will be there, and they'll be making Eric's basement into the theatre/game room that he had always intended. And they were excited about it. And I was excited for them. Good bye home sweet home. You have been so very good to us: keeping us warm in the winter and cool in the summer, and keeping us safe from all manner of floods and tornados that caused trouble in our neighbors homes, but not ours. Most importantly, it kept my sweetboys safe, comfortable, and dry during some really tough years. In the immediate days since the sale, we went to the grocery store AND Costco in the same week. We hadn't been able to afford to do that in ages. And we're getting all set up for a big Surprise for the kids - a trip to Disney World. You know how when Chris had his feeding tube and it was Awful and we kept saying, "when all is said and done, we're going to Disney World." Remember? Well, we went. And Goodness knows that this last year has been so rough on my loved ones, that we have earned it again, with Eric building the house, while working full time, and Chris and his surgery. We just had to wait until next year because Eric's vacation time got all zapped out with the house building. But now we're all set up in the New House, and the old one is finally sold. Thank the Lord. We couldn't handle the double mortgages any longer. So now is the time to get Festive. Time to start new traditions in the new house. We're celebrating the end of a hard year, and readying to celebrate the Birth of him who made it all possible. How Blessed we are! Now is the time to Cuddle up and watch Rudolph, or to decorate the tree. We found a teeny tree in storage, one that used to sit on a small table in our room, before kids, so we unpacked it, put it on the boys' train table (also recently unpacked) and covered it in blue lights (Eric's favorite) and our Sterling Silver Snowflakes (my favorite). And we have this tree up in the loft. The kids enjoy it, and it gives off such a homey pretty blue light. Now is the time to ready ourselves to say Merry Christmas! I could call this entry, "What I did on my Thanksgiving vacation... besides Eat." First and foremost, we were blessed with 2 gorgeous days worth of weather this past weekend. On Thursday, we traveled to Marion, took a walk, ate, ate, and ate some more. Friday was pretty casual for us, we had a nice breakfast, and Eric got up on the roof. I couldn't watch, it was too scary high for me. 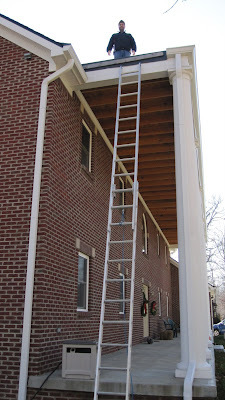 But the good news is, our porch roof is 23 feet off the ground, and our extension ladder goes exactly 23 feet. Oy. So Eric put up our blue Christmas lights, across the house. But since Sam needed a nap, and Eric was working, Chris and I got a wild hair and went out on Black Friday to Pottery By You, where you can paint/glaze pottery. I thought it would be perfect for Chris to make a Christmas gift for his teacher. I am really enjoying going on one on one dates with Christopher. He even opens my car door for me. He's going to make some lady a great husband. We had some great Quality Time, and stopped for burritos and cupcakes for a late lunch. We did begin the process of decorating the house for Christmas. Though we got a little distracted about halfway through, so for a while, the house was playing it's own dueling banjos version, Dueling Holidays. Part of the reasons for interruption was my fault. A big part. I got a wild hair and bought Eric a Tree, the story of which is another story, but as you can see, we bought Eric a tree, and Eric's dad came running when I asked for his help to come plant it. After working in the yard, and taking a small rest, we went to Oma and Opa's for dinner. It's my favorite meal, my stepmom's Thanksgiving leftover turkey pie. I know it's crazy to like the turkey pie more than the main meal, but she's such a great cook, that everything all piled together in a pie is pure heaven: turkey, mashed potatoes, stuffing, all in a scratch pie crust, smothered in gravy with butternut squash on the side. My Fav. And they had their tree up and ready for Christmas festivity on Friday, so by Saturday when we were there, the kids were thrilled. Chris is getting very pumped up about decorating for Christmas. So this year he's been helping me. It's going a lot slower than last year, because everything now needs to find a new home, it was hard enough putting up the stuff when we knew where it went, this is tougher. It is going to be gorgeous and fabulous when all is said and done though. We came home and watched Family movie nights every night. Thursday we watched Charlie Brown Thanksgiving. Friday we watched Gnomeo and Juliet, which was quite cute. Saturday though, we were tired after playing at Oma and Opa's, so we stooped to an episode of Spiderman. So Sunday to do the weekend justice, we took the boys to The Muppets. It was a Wonderful movie. I'd Highly recommend taking the kids. My boys loved it, and I really loved the shoutouts to all the classic stuff, guest stars, old songs, and everything. I enjoyed it thoroughly, I can't wait to own it. :) But I think we started some new traditions this weekend. Especially our focus on Family Time together. This was the most relaxing holiday weekend we've had since the whole house thing started, and it was still full of work. But it is finally feeling like Home. Happy Thanksgiving to all Friends and Family. We have been so Thankful for the support of friends and family through the last year. This holiday was actually relaxing. We watched a bit of the Parade before driving up to Marion. Just in time for Turkey with all the Trimmings. After lunch, we took a walk, watched the kids play frisbee, and we sat around practicing our yarn arts. I got to practice my teaching skills teaching crochet to Erica, then Alexis, and even Kaylee. It was a lot of fun. The boys held on for a while, Chris ran wild playing with dominoes, and crayons, and having fun with all the cousins. Sam just chased everyone, until his pants were around his ankles. So we debriefed him, and he held on until 4. Then he walked up to Daddy and said, "Daddy I want you." He was exhausted, blithering. Eric asked him if he was tired. He said NO, I want you. Then Eric picked him up, and put him on his shoulder, where he promptly passed out, and slept on Daddy's shoulder for 2 hours. It was so sweet. It is Done. We have emptied out the old house. It's taken a while. We stopped and walked through Sunday after church. We thought we'd be Closing on Friday, but the possible owners' mortgage company didn't get the info to the title company on time. So we bumped it to Monday, but the other people said the one and only time the title company had available for the week didn't work for them. And that they'd get back to the house. Well, we thought we'd be selling the house this weekend, so we had it all ready, Eric brought out the last of the goodies, so I wanted to take the kids to say Goodbye. So here's a walkthru video (that took forever to load) if you want to see the Old House empty. Pretty weird. Bittersweet. But this house was very good to us. We have a new visitor. I saw something strange yesterday, I was watching out the back window as Chris was having his snack and we were doing homework. Chris calls out, "SQUIRREL!" No he wasn't doing just a quote from UP! There really was a squirrel. I watched as she pulled a pair of dying leaves off one tree, and hopped to another tree, a mostly dead tree, and disappeared. So sweet, little Squirrely Squirrelson making herself at home in our mostly dead tree. I hate to tell her I was thinking on cutting it down in February. This week a dream came true for our family. It started long long ago, when a young girl named Marie Grady and her sister played the piano. Marie married my Great Grandpa, Homer Bagg in 1910. As a wedding present from her family, they were given a 1909 Steinway Baby Grand. They were transferred to Ft. Multrie, KS where they had a little boy, Homer Jr. He retired to La Jolla, CA. When Homer Jr. was 18 he joined the Army, and changed his name, on purpose mind you, to James Bagg. (Yup, Jim Bagg before there was a Gym bag.) Upon Grandma Marie's death, Grandpa Jim and Meb gave the piano to my Dad, who though he didn't play, my Mom did, and she played well. My sister and I took piano lessons on it, but more often than not, just listened to my Mom play. Long ago, my sister and I were duking it out as to who would get the piano. But of our generation, only Eric still plays; he double majored in music and computers, so it certainly will get a lot of use here, so Lisa graciously let us have dibs. When we were in New York, my Dad asked if I'd like the piano for Christmas since we now have room for it. I cried. And so it was delivered on Wednesday. We should have it all set and tuned in time for Christmas tunes! It terrified us to see it moved. My Dad couldn't watch. I was intrigued, from a scientific standpoint. But I had to hold one of the kids, under the guise of keeping them away from getting trampled by a piano, but mostly to remain calm myself. Somehow 'having to be calm for the kids' keeps me more calm. The movers were wonderful, so thorough, they didn't move until they were doing, where they were going, set. They even parked on the street, because they didn't want to mess up our new driveway. Apparently concrete and giant trucks don't do well. They had a wood plank they put down on any step so they could roll right over it. That's how they got it up our steps. Each leg was disconnected, but labeled ages ago, since when this piano was made, each leg was a bit different, very custom you know since it wasn't done on an assembly line. They put two of the legs in, hammered them in place with a rubber mallet, then tipped it over, and got the third leg in. Oh, I was so nervous, but as you can see it was padded and secured the whole time. Now it is in place. And it's not moving for a while. Sam wanted me to tickle the ivories too. But I didn't stick with it long enough like Eric did, so all I can really play is part of Heart and Soul, or Chopsticks. I did play them! I did tickle these ivories. They are genuine ivory too. It was made before they put an outlaw on ivory keys. But the piano hasn't been tuned in somewhere around 15 years. So it's going to take us a while, time and tunings, to get her into concert shape. In the mean time, it doesn't matter if it's tune or not, when the boys give us their own concert. They make Beautiful Music!